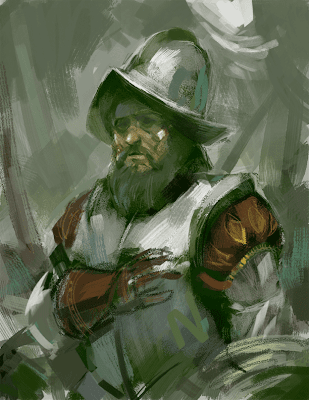 Here is a quick color test for what I have in store for an upcoming conquistador illustration. This is maybe 30-45 minutes in class today with some limited reference. The goal of this illustration is just to use color more adventurously, and so far Im having some fun with it. Another sweet sketch. Keep'em coming! Nice and loose, which is always fun to see. lookin good mike, what did payne say about it? Well, Payne I think liked it, but then went off on a brighter colors rant. So now I have to switch off of this project and do something way colorful. wow Mike! this is awesome! love your loose brushstrokes man!